Allstate Product Design Manager, Dustin Hamilton, started mentoring Designation UX and UI students, and soon realized that many of them would be great additions to his team. He has now hired six Designation graduates, and continues to mentor and get to know many of the designers as they go through the program. Dustin tells us why Designation is his first port of call over other education providers, what the interview process involves, and why he will keep hiring Designation grads. He also advises other employers to research the curriculum of a UX and UI bootcamp before hiring a grad. Can you tell me about Allstate and your role there? I'm one of two product design managers at Allstate. The user experience and design organization here is more than 130 people right now, and we manage a team of 44 product designers. We have a unique working model with a product-centric viewpoint. It's called Agile XP which stands for extreme programming where we do pair design. We take two designers, put them at the same table, and they each have a keyboard, mouse, and a monitor connected to a single computer. So they're working on the same thing at the same time. This model drives the need for somebody very articulate, somebody who has a lot of empathy, communication skills, and emotional intelligence. 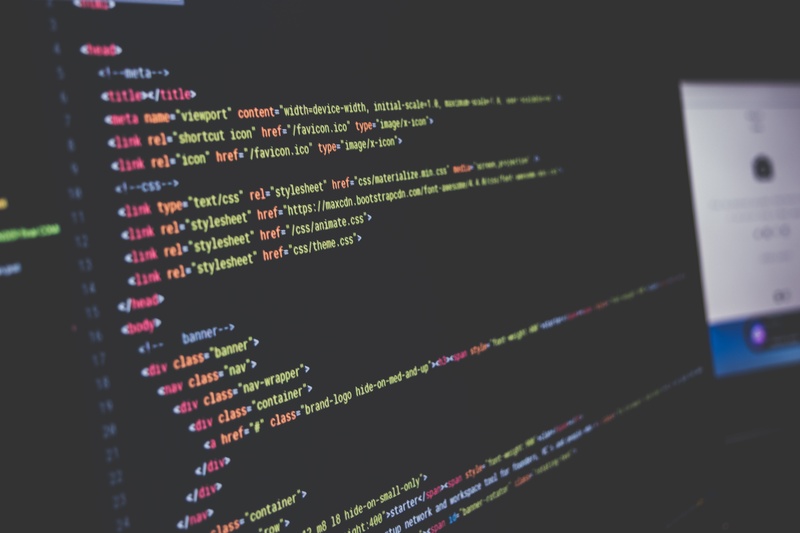 For people who are new to the technology industry and the way design teams work, could you explain why an insurance company like Allstate needs UX and UI designers and product designers? Allstate was traditionally an insurance company, then we began offering mobile apps and things of that nature. Insurance is still the core of what we do, but you could argue that Allstate is now a software company that also has insurance. We've done so much in the digital space outside of insurance, that arguably it's not the same company that was here five or ten years ago. It's a very different space at this point. Do the product designers work in all areas of Allstate operations or are there specific places? We work on all aspects of things. Not everybody in our design organization is a product designer – we also have specialists like UX architects, visual designers, and specialist researchers. The product designers are responsible for small teams doing the visual design, architecture, research, and content. They're very generalist kind of roles. We've got product designers who are working on everything from call center apps that we use internally, systems administration tools that our IT team uses, software and rollouts, and of course public facing mobile and desktop apps. We also do business to business apps. How did you first get connected with Designation? When I first learned of Designation, I didn't look at it like an HR tool. My initial involvement was mentoring and speaking where one of the curriculum directors asked me to teach some classes on how to do design critique. It went really well and I was mentoring a number of Designation students. Then my involvement grew and so did my mentoring. At one point about 18 months ago, I would meet with a student every weekday to help them get their career started. I think that kind of mentorship is really important because it's not a resource I had when I started doing design work more than 14 years ago now. User experience didn't even exist then. Later in my engagement with Designation, I've been able to help get a number of designers hired because I see a lot of talent through the mentoring program. When you see somebody who clearly “gets it” beyond their education, that's always a great thing. So I help connect students to people I'm connected to within the community so that companies can hire great talent. Are you still mentoring Designation students now? Yes. It's lessened significantly because I'm helping others get involved. 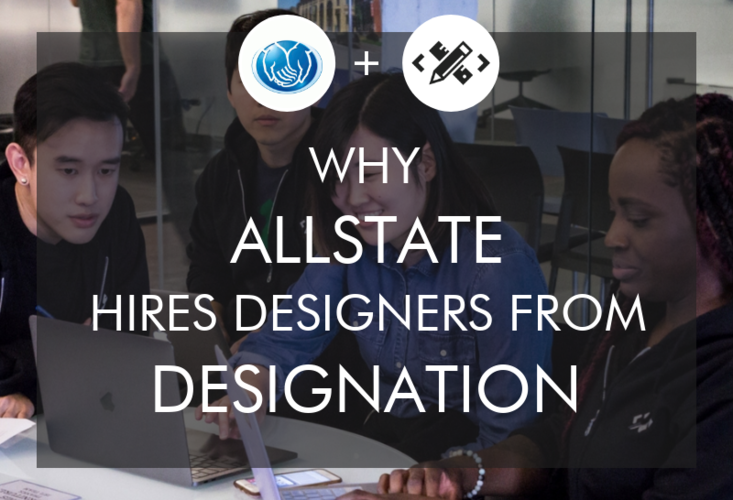 At Allstate, at least half of the product designers and UX and UI practitioners mentor designers from Designation. Actually, I think Designation got to the point where they had too many mentors from Allstate and not enough students! We also present once a month at Designation to give students an opportunity to learn about something different outside of their schooling and it gives us a chance to practice our consultation and presenting skills. I see it as an opportunity to help a very lean, scrappy program at Designation where designers are learning very rapidly, hands-on, and almost in a very gritty fashion. I have a strong appreciation for that. How many Designation grads have you actually hired and what kind of roles are they in? I have hired six so far, but there were other Designation hires at Allstate before I started in Chicago. My co-manager, who handles our Northbrook location, has a number of Designation folks on his team too. Needless to say, we hire from them quite a bit. The Designation grads on my team are all product designers, which are purposeful generalists. We work in a pair design model and they do everything from visual design to architecture, to research. They do their own content creation, planning, and strategic work at the product level. What are you looking for in a new hire? And what was it about those Designation grads that got them the role? What I'm really looking for are people who shine in regards to soft skills. How do they communicate, how do they present themselves, how are they working, are they collaborative, do they have a sense of community? It's that kind of stuff because our model drives a need for soft skills. Whatever hard skills someone might be lacking, we as a group can help train them. I mentored two of my Designation hires myself before hiring them. So I already had a sense of their communication style and skills. My own personal mantra is to hire personality and train skill. I fully recognize that anybody coming out of Designation has merit anyway, because they have the ability to learn quickly. I think there's a spectrum of practitioners out there. On one end, I find the best designers have a broad sense of their skills. They've got a firm understanding of what they know, and an acknowledgment of all the stuff that they don't yet know. People with that mindset are more open to grow and learn. The opposite end of the spectrum is somebody who knows what they know but doesn't have an acknowledgment of what they don’t know. That limits their growth because you can't present them with new information and knowledge because they think they know everything already. But even at 15 years into this career, I'm still learning. What kind of interview process do you put new hires through? Do Designation designers go through the same kind of interview process as any new hire? I use the same process regardless of where somebody's coming from. It starts with a half-hour video conference where I describe our working model. I'm also interested in communication skills, focus, personality, that kind of stuff. If somebody is interrupting or asking what the salary is, that indicates to me they don't have a sense of the big picture. Then if I feel there's merit there and mutual interest, I’ll invite them in for an interview. Part of the interview is a discussion to get to know the candidate and their background. Part of it is also like a showcase – I want to see a piece of work that people are proud of or learned a lot from. I'm looking to see how they articulate the process they went through, and then the pros and cons. Anybody can tell me about the great things they did on a product, but when somebody tells me, "We made this decision and it didn't work so well,” that's the kind of person I want to work with. Someone who isn't afraid to share that something didn't work, and acknowledges that design is a gritty process. What are you looking for in candidates? Any tips for the interview process? One of the key elements we do is a design exercise. We role play with the candidates where I act as a business owner, give them a client brief, and they have to act as if they were a consultant. 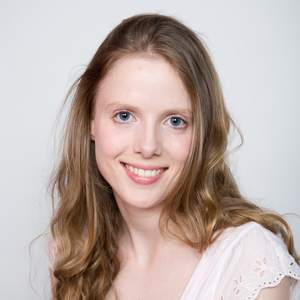 I'm looking for how the person speaks and how they present themselves. Were they pacing, do they have their hands in their pockets, are they focused on the problem or are they talking about solutions already? Are they are asking questions and if so, are they good questions or are they superficial? So it's not the work itself, it's more like the “how”. My most recent hire, we were doing the design exercise and it was 11 minutes in. I just started laughing and I told them, "You're hired." My guidance to everybody is just be yourself and do what you would normally do. It's not an assessment of skills. It's assessment of working style. How important are candidates’ backgrounds from before Designation? Do you factor their previous backgrounds into their suitability for the roles? It's always cool to hear about, but I don't consider that so much in hiring. It matters to me more that they got through the program successfully, and that they've got a good mindset. Then usually I can speak directly to Mike Joosse, Designation’s President, and find out more about an individual. I’ll get the intricacies of how they worked, where they worked, and what their challenges were. That means far more to me than what their background is. I like to mentor a lot because, unfortunately, the people who didn't come with some kind of background that's relatable to UX and UI have a harder time getting their first jobs. So I work with them to help them showcase their portfolios, resumes, and their interview skills, to try to help them get that first role. When those Designation grads first start at Allstate, how much training do they need? Are they quite well prepared for the job already when they start or how much training do you have to give them? Because of the way that we work in product design, I would say that everybody needs leveling up, not just Designation designers. Because of our unique working model, it takes all new hires about a month to really get into a good routine. The Designation grads bring a good mindset; they are eager to learn and they approach things with curiosity. We also do a week-long product design bootcamp periodically for everyone. The Designation designers are excited when they hear that we have a product bootcamp, that we are investing in them, not only in their future here but elsewhere as well. A true mark of success for me is if any of these practitioners down the road says, “Dustin really set me up for my career." That would be awesome because I know this likely isn't an endpoint – I want to make sure they get set up in their careers. How do you ensure that those employees continue to be supported in their learning as they progress? Do you have any kind of mentoring or apprenticeship-type programs going on? We do. As I mentioned, our working model of pair design involves two people working from the same computer, with a monitor each, looking at literally same thing. It's difficult to find people with a generalist background in UX, UI, content, and research. So I often pair somebody from a UX background with somebody from UI background. Then that UX person will teach the UI based person about architecture, and that visual knowledge of the UI person is transferred to the UX person. So through that way of working, they are leveling up their skills constantly. We also have the notion of pairing with a specialist. In some of our product teams, we have data scientists, so instead of a product designer pairing with another designer, they sometimes pair with a data scientist. It's all about mutual sharing of information so that the data scientist learns about the product, and the product designer learns about the data, how to use it, and what it means. There's a lot of learning that takes place. I’m also very thoughtful when I put together management and reports. I’ll take a senior project designer with a very strong UX architect background and have them manage somebody who's visually based. And I'll do the same vice versa. Allstate is one of the best places I've ever seen for investment into employees – we do all kinds of training. Since you've hired those Designation grads, have any of them switched roles or been promoted or do you anticipate that might happen in the future? Oh, they definitely will. We have three levels of product designers. The first two levels are product designers, and we treat them the same. If you're in the more beginning stages of your career, you're in the first level. If you're at the higher end of experience, equating to a mid-level practitioner, you're probably going to be in the second level. The third level is the senior product designers, who typically have five years of experience or more. So eventually those Designation grads will progress through the ranks. Other than Designation, what other talent pipelines do you have for UX and UI and product design hires? Are there other bootcamps or university programs that you look at? If I'm looking for an entry-level practitioner, Designation is my first go-to. I will consider other bootcamps and other practitioners who are experienced or just starting, but I think because of my knowledge of the way Designation works, I feel more confident when I make a Designation hire. With Designation designers, I know what they're learning, and I know who they learned it from. At any point when you were first thinking about hiring from a bootcamp, did you have to convince anyone else in your company? I'm pretty transparent about that kind of thing, and everyone knows I'm a big fan of Designation. I advocate for the students whenever I hear an opening suitable for a fresh Designation graduate. I’ll give them three or four different candidate names and letters of recommendation from the people at Designation. Are you able to give feedback to Designation and influence their curriculum if you notice any areas that your UX and UI hires might be under qualified in? Yeah, I do look for that. Mike and I meet on a periodic basis and talk through those things and I give him a lot of direct feedback. When we walk away from those sessions, I know Mike is going to do what he feels is right for his students. I used to teach a class to every Designation cohort about mindfulness design critique. The students and staff reacted so positively to that, that they actually integrated it as part of their curriculum. So it's neat to be able to say that I can help influence what their students are learning to make them even better candidates. What kind of relationship is there between Allstate and Designation. Do you have to pay a referral fee when you hire their graduates? No. I would say it's semi-formal. We do a lot of work with them. We mentor a number of their students, and we do monthly presentations. One of the cool things about the relationship is my access to the Designers in Residence program. For every cohort, they pick one student to stay on for three months to be the Designer in Residence and work at Designation teaching other students. You could argue that the top designers out of every cohort get that role. What I do, which has benefits for me and the students, is meet with every Designer in Residence personally for an hour here at Allstate. And it's not necessarily a hiring thing for me; it's getting to know who is the top talent coming out of Designation and entering the design community, and helping get their careers started. I work with them to make sure that once they finish, they hit the ground running and get a good job. Getting to know those Designers in Residence means that when I end up with staffing needs I've already got a roster of the top recent Designation graduates. I can just make a few phone calls and see if anybody's interested in making a switch. That really goes a long way in shortening the hiring process. Will you hire from Designation in the future and if so why? Absolutely. I like to say that Designation is a very meaty program, and when you come out of that program you've got one of the best baseline skill sets that you can grow upon. It really allows the students to have their personality shine to show that they have the soft skills to back up their hard skills. Designation is one of the first places I look when I'm looking for a fresh graduate, then also I'm keen to meet alumni as well. Have you hired a Designation grad who's already had another job in design? Yeah. Sometimes I will simply reach out to Mike and say, “I need somebody that's got two or three years of experience. Who is your best?" And he'll give me a list of two or three designers and a detailed synopsis of what they've done and how they did. That's an amazing resource to have. What is your advice to other employers or hiring managers who are thinking about hiring from a design bootcamp or any kind of technology bootcamp? Designation is a meaty program where the designers come out with that solid baseline set of skills. They know how design really works and that design isn't a pretty process. They come with an eager mindset to not only show what they know, but to learn what they don't. The reason that ‘bootcamp’ is an alarming word is that it's so loosely defined. For instance, another program here in Chicago is one hour each week for four weeks. So you're learning UX and design in four hours. My advice to employers is to look deeply at differences between the bootcamps. Look for schools that have assessment or intake processes and don't be afraid to ask about placement rate. Designation doesn't take just anybody who applies, and they have a very high placement rate. Look at all aspects of a bootcamp and know that they're not created equal, and the terminology is often not the same. Find out more and read Designation reviews on Course Report. Check out the Designation website.